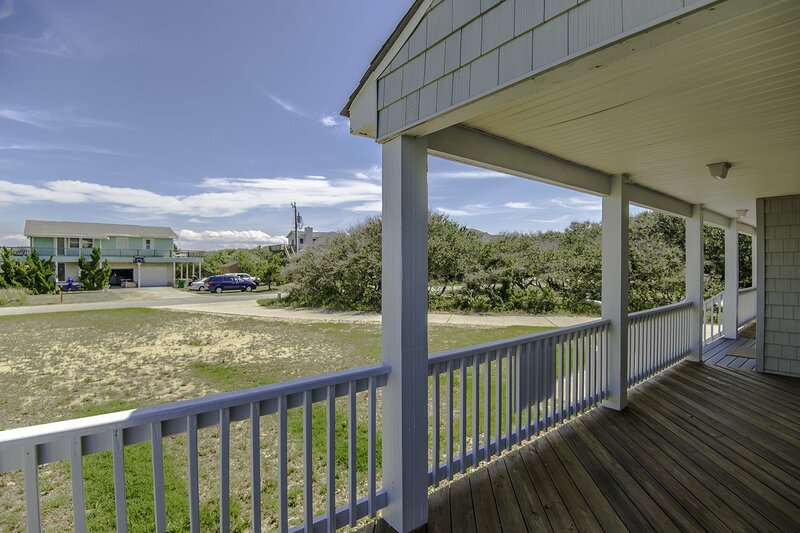 Spacious & very well appointed, this lovely Southern Shores vacation home will make your family vacation a "Shore Thing". 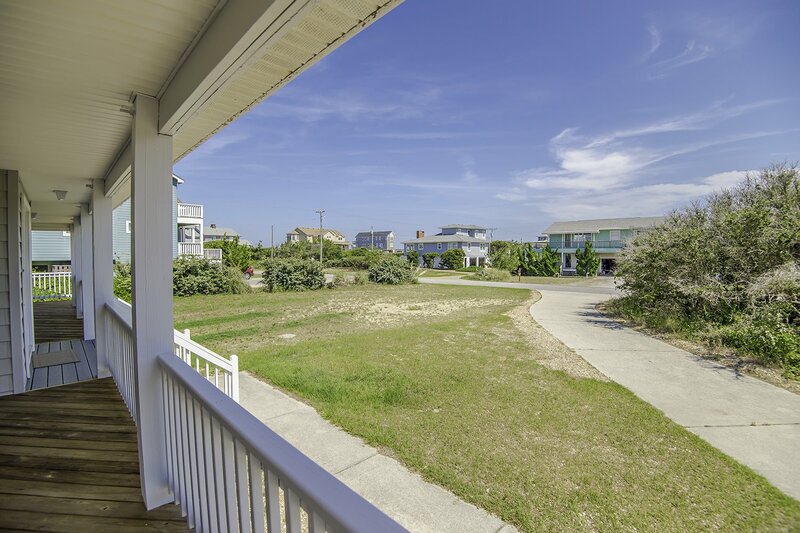 Located approximately 150 ft. from the Beach Access at Third Avenue (3rd house from the Ocean) your family will love being so close to the Beach w/ Direct Access & no traffic to worry about. 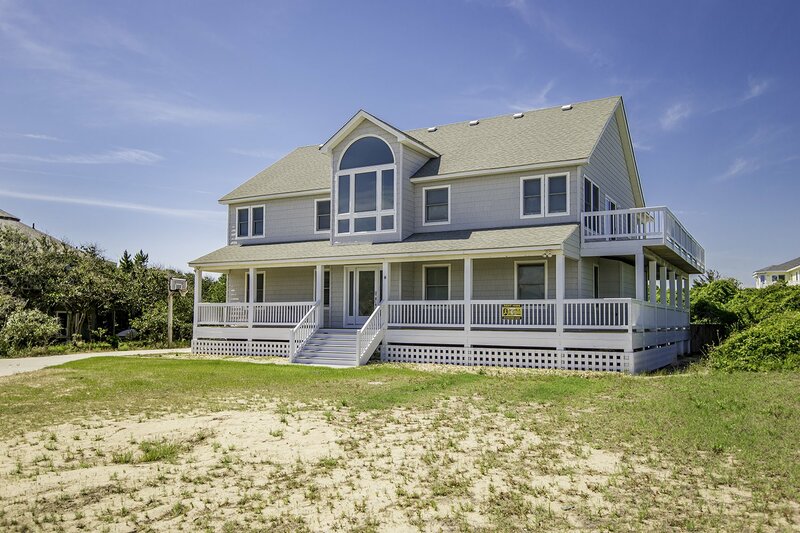 Equipped w/ your family's enjoyment in mind, you will love the features it has to offer including a Large Private Salt Water Swimming Pool & Rec. Room w/Pool Table. The open floor plan provides ample space for your group & is perfect for your family vacation. This home provides a quiet & relaxing location that will leave you feeling refreshed. Ground Level: Parking for 4 Cars, Steps to Covered Entry, Basketball Hoop, Enclosed Outside Shower, Gas Grill, & Large Private Salt Water Swimming Pool. Level One: Entry to Home, 3 Bedrooms (1 Master Suite w/Queen, TV, & Full Bath, 1 w/Queen & TV, & 1 w/Duo Bunk & TV), Shared Full Bath, Rec. Room w/Pool Table, Laundry Area, & Wrap Around Covered Deck. Top Level: Beautiful Living/Dining/Kitchen Area, TV, Stereo, 2 Master Suites w/Kings, TVs, & Full Baths, Half Bath, 2 Sun Decks, & Covered Deck w/Picnic Table. Features include: C/AC & Heat, Washer/Dryer, Dishwasher, Microwave, Phone, 7 TVs, Stereo, Wireless Internet, Baby Equipment (High Chair), Ceiling Fans, & Pool & Deck Furniture. A Member of the Southern Shores Civic Association (SSCA) which provides you w/No Fee Access to 4 Miles of Southern Shores Beaches w/Parking, Boat Launching Area, 3 Soundside Marinas, Soundside Bathing, Beach, & Picnic Area, Sea Oats Park/Play Ground, & Walking/Biking Trails. No Pets. This is a Non-Smoking Unit. Awesome house! It was laid out perfectly for a multi-family vacation, and the pool deck and porches got a ton of use. Overall the house was nice. Location was good. Grand childen enjoyed the pool. The pool is great and it's so close to the beach. Peaceful environment. Our family really enjoyed this property.It is a great location. Plenty of room, lots of outside deck and porch space. Kitchen is stocked with pretty much just basic needs. Layout of the house is great, and inside is well maintained. Loved the location of the rental home. It was well equipped and furnishings were in good condition. 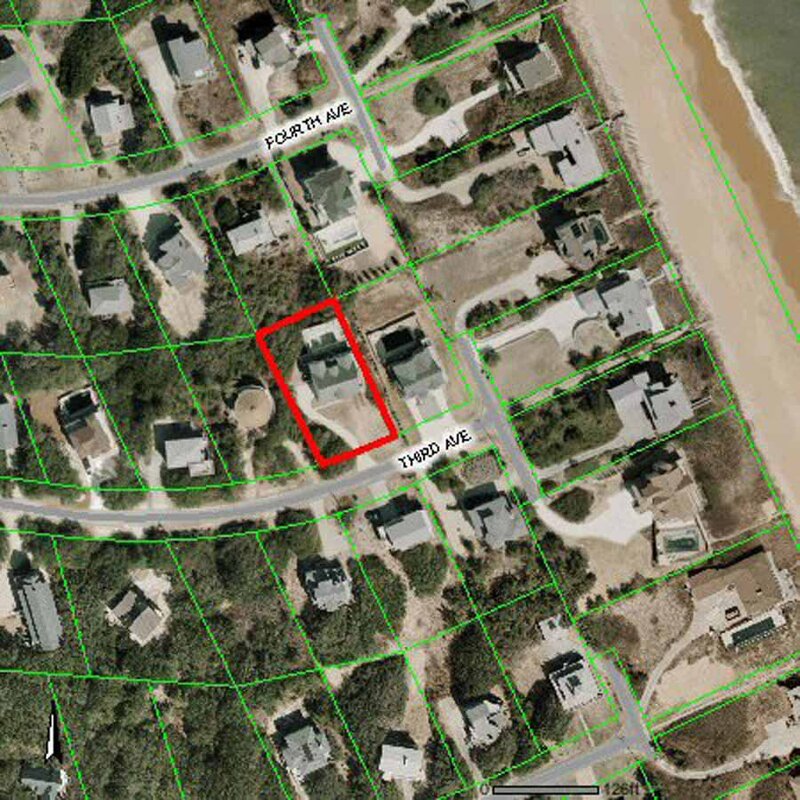 This house is in a perfect spot, close to the beach on a nice quite neighborhood. Great for families with children cause of no traffic and it has a great pool. 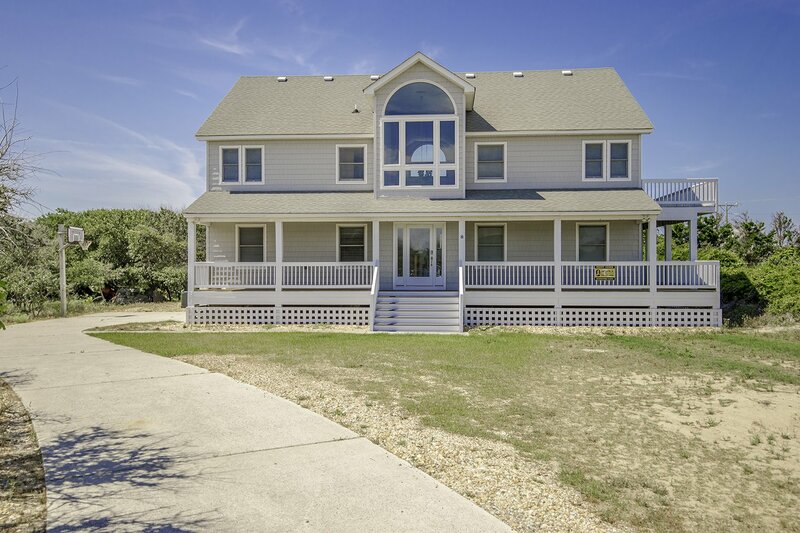 The beach access is a huge plus with this vacation home. The pool is a good size. The living area has plenty of seating for the whole family. The beds were very comfortable. I feel it is a great place to be the pool is excellent. We had great weather while we were there and a nice little stroll to the ocean beautiful sight. All in all the house is beautiful. Beautiful house. Great location. Nice amenities. Rooms are big and spacious.